Two questions are likely to go round in the minds of Harnoncourt fans contemplating this purchase: Does the performance match (or even exceed) the high standards of his Das Alte Werke cycle? And are the contributions of the soloists commensurate with their stellar reputations? Yes is the simple answer to both questions. 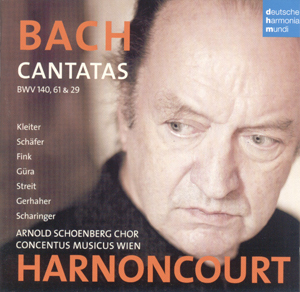 After a lifetime of directing Bach performances of the highest standard, we should expect something special from Harnoncourt, and he doesn’t disappoint. The Das Alte Werke cycle was shared between Harnoncourt and Gustav Leonhardt, but these three cantatas were all directed by him, so in some senses the comparison is quite direct. And certainly the interpretive bond between conductor and composer is essentially the same after all these years. Many of the instrumentalists are also shared between the two recordings, including the exemplary Herbert Tachezi, whose organ accompaniments in BWV29 are as sprightly and fresh now as they were in the early 1970s. The main difference is the choir, and the fact that these performances use women’s voices, both for the solos and in the ensemble. It is also a larger choir, I think, and I suspect a larger orchestra too. Listening to the two readings side by side, the weight of both the orchestral and choral sound is what really distinguishes this new recording. Superior technology may also play a part in this, as may the rich, pure acoustic of the Musikverein. The bass end of the orchestra and continuo have a real presence that is lacking from the earlier recording, or at least seems lacking in retrospect. A common perception about the trajectory of period performance in the intervening decades is that players have improved their proficiency on the instruments they use. The only difference I can detect in this respect is the fluency of the oboe obligatos. The phrasing seems more eloquent this time round, be it through greater freedom of rubato or subtly of dynamic gradation. And the lower end of the oboe (and taille) tessitura is another great beneficiary of the superior audio. Tempi, on the whole are very similar to the last time round. One or two movements are noticeably faster, including the opening chorus of Wachet auf and the final Amen chorale of Nun komm, der Heiden Heiland. Is Harnoncourt more confident of his all-adult choir in these passages? Or maybe he trusts the high quality audio and superior acoustic to clarify details that may otherwise be lost. The soloists all stamp their individuality onto their respective arias and recitatives. And just like Thomas Hampson and Paul Esswood the last time round, all give full-blooded, emotive and lyrical performances. All are good, but my favourite performances are from the men. Anton Scharinger’s bass in Wachet auf has a real warmth and presence. Similarly Gerald Finley in Nun komm, der Heiden Heiland, his a penetrating yet round tone matching beautifully the tutti pizzicato of the strings as he knocks on the door in Siehe, ich stehe vor der Tür. Christian Gerhaher is woefully underused, appearing only in Wir danken dir, a casualty, perhaps of a lineup already oversubscribed by top names. I’m not really a fan of Christine Schäfer’s wide vibrato, but I suspect I’m in a minority there. Her Genank an uns aria was the only track on the disc that I would sooner have heard from a boy treble. The project has been described in the press as Harnoncourt’s 80th birthday present to himself. And why not? In recent years he has stretched his repertoire to works that would have seemed unimaginable in 1974, I’m thinking in particular of Porgy and Bess, so it is a well-deserved return to home ground. Few would expect radical changes to his interpretation, and those that he makes seem to have been motivated primarily by the change of venue and soloists. If you liked his original recordings of cantatas 140, 61 and 29, you’ll like these, and the modern audio makes the whole experience just that little bit more satisfying. However, anybody expecting the success of this disc to lead him to embark on another full cycle may be disappointed.